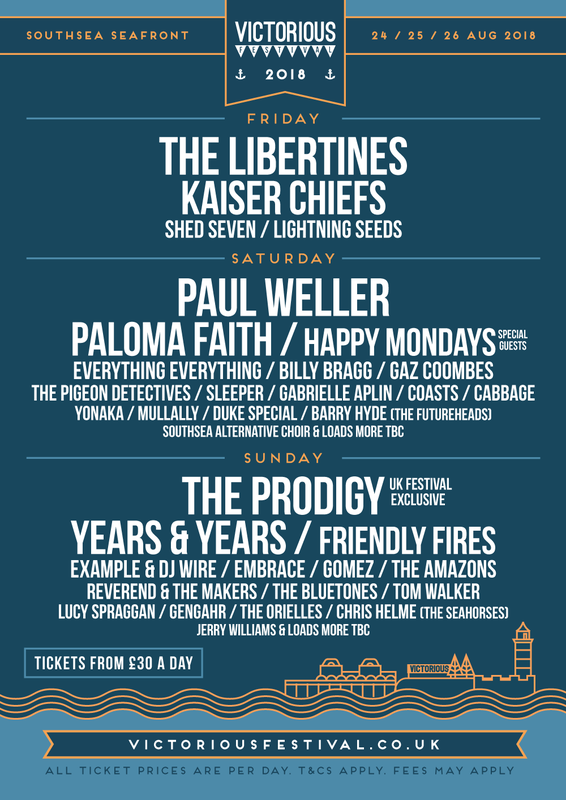 The Prodigy and Paul Weller now join The Libertines and Kaiser Chiefs as this year’s headliners for the festival that takes place on Southsea Seafront in Portsmouth between 24 and 26 August 2018. Additional second phase artists also revealed today include Paloma Faith, Friendly Fires, Years & Years, Happy Mondays and Everything Everything. Rave pioneers The Prodigy are to headline the Sunday night at the festival, while Paul Weller will top the bill on Saturday. Also added to Victorious Festival today are Gomez, The Amazons, Embrace, Gaz Coomves, Billy Bragg, Pigeon Detectives, Coasts, Gengahr, Cabbage, Yonaka, The Bluetones and Sleeper.